and if thou seek me in the morning, I shall not be. 1994 was an intriguing year in music. Jeff Buckley had begun his tragically halted rise to fame with the debut studio album Grace; Portishead brought trip-hop to the mainstream with Dummy; Kurt Cobain shocked many of my generation with his suicide; Pierre Boulez won the Grammy for Best Classical Album with his Deutsche Grammophon recording of Bartók’s The Wooden Prince; and the wildly popular Chant by the Benedictine monks of Silos had taken the North American market by storm. And then there was Officium, a humble recording with the distinction of being the only ECM album I have ever seen advertised on television. I don’t think anyone knew what to expect of its unique combination of soprano and tenor saxophones and choral skimmings from the 12th, 15th, and 16th centuries, but I can still remember the splash it created, selling the better part of a million copies. I made sure to buy mine on the day of its release, simply because of its label and its musicians, and continue to be mesmerized by its sounds to this day. With so many ECM recordings floating through my CD player, it had actually been years since I’d heard this album before revisiting it for this review. I’m pleased to say that, despite the unwarranted flak it has drawn (which, as much as I can tell, is far less than the praise), Officium has aged beautifully and remains a pinnacle of nostalgia in my life as a listener, for it provided some of the most delectable nourishment imaginable at a time when my budding mind was ravenously hungry for new sounds. 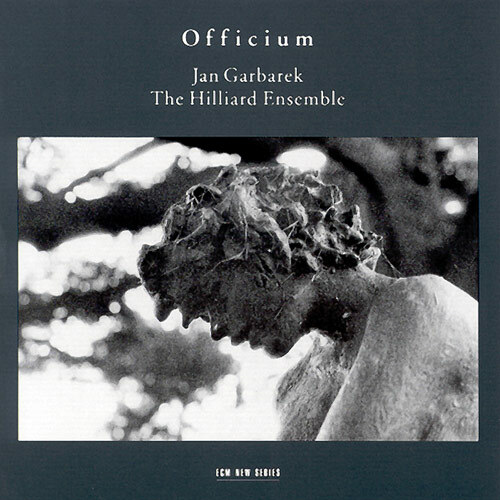 At its core is the Hilliard Ensemble’s choice of music, much of it open to interpretation even in its day, by composers such as Pérotin, Pierre de la Rue, and Guillaume Dufay, in addition to a range of earlier anonymous (much of it Czech) material. The opening track, combining Garbarek’s liquid improvisations with the Parce Mihi Domine of Cristóbal de Morales, will always be the one that speaks to me most clearly, if only because it was first to lure my heart into the album’s many inner sanctums. I would say that any claims of disjointedness are quickly dispelled by the anonymous Primo tempore that follows, in which Garbarek’s tenor swells with the mournful quality of an additional human voice. Some tracks are more seamless than others, which is to be expected in the first release of this innovative and ongoing project. Regnantem sempiterna, for example, gives Garbarek less room to work with, forcing him to wriggle his way through a narrower set of possibilities. But then there is the Pulcherrima rosa, during which I sometimes need to remind myself he is even there. There are also those fascinating moments, especially in the Sanctus, when Garbarek descends into unexpected territories, as well as his seductive solo turn in Virgo flagellatur. Either way, Garbarek has an acute ear for vocal contours and matches his playing accordingly. The Hilliards are in typically fine form. Procedentem sponsum and Beata viscera both feature sublime solos from David James, who navigates the droning landscape with utter faith, and Gordon Jones’s* lone rendition of the Gregorian chant Oratio Ieremiae provides some of the loveliest moments on the entire album. Parce mihi domine is reprised at the program’s center (without saxophone) and again at the end (this time, with), thus enacting a tripartite ritual throughout its overall cohesion. I like to think that Officium led listeners to look at some of ECM’s other fine recordings, if not at other choral albums in general, both new and old. Regardless of any dismissals of this album as a failed New-Age experiment, I like to think of it as a glorious window into a timely solace that enriched the lives of many. Like any album, it may not be for everyone, but one need only take a peek to see what effect(s) it might have. *Many thanks to Joanna Z. for this correction.